The 2010 NAIDOC Poster is available from www.naidoc.org.au. The poster was created by Sheree Blackley and is titled Unsung Heroes - Leading Through Example. Description of work: The artwork depicts an Aboriginal mother who is an 'unsung hero' leading her children through example, showing that actions can speak louder than words. The dot work illustrates nurturing and teaching from birth, always guiding our children towards 'closing the gap', towards 'success' for those who choose to stay on the path. You can order copies of the poster from the National NAIDOC organisation at www.naidoc.org.au. 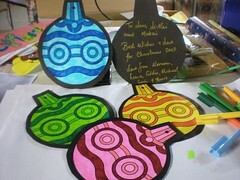 The Stronger Smarter Institute (SSI) is also holding a NAIDOC Poster competition for 2010. Check out the details here. Entries close 25th June. There are prizes for individuals and schools. This article this morning announced that all ACT schools with be teaching Ngunnawa landcare knowledge. Wow! What a fantastic initiative. The biggest hurdles I would anticipate would be ensuring that schools are provided with the budget to ensure that Ngunnawa teachers are paid appropriate wages and ensuring that there are enough teachers to be able to provide all ACT schools with the service. Looking forward to hearing how this initiative pans out. A new commercial website enterprise, The Bama Way is now available. While specifically targeting the tourism market, there is a deadly map that features information about Bama country. Great for geography, and history. Found this today, via an Education Qld staff member. Its Echo Adventure & Cultural Camp in North Queensland. South of Cairns and West of Tully, this is Jirrbal country. So if you're a staff group seeking cultural awareness training, or even with your own students, consider this one. Using Google Maps + Tom Petrie's Reminiscences of Early Queensland: Dating from 1837 by Constance Campbell Petrie (1904), I've started creating a map of Aboriginal Place Names of Brisbane. Its in its earliest of days yet as I add in a couple of names each week. I'm also looking for other sources I can use (aside from Campbell Petrie's) including local community people. If you've never used Google Maps before, just go to http://maps.google.com.au/. If you get stuck (which I often do if its been a few weeks since the last time I worked on the map, just click "help" in the top right hand corner. There are short videos as well as questions & answers from other people. Extending your Google Map - here is an article about how to work further with Google Maps. I'll be looking for more ideas over time. Don't forget you can embed the map into your wiki or class blog as well. Aboriginal and Torres Strait Islander students studying business? There are then numerous sub-topics including social media, having fun in business, pricing, innovation. The blog is accompanised by the wiki - artist-as-entrepreneur (which is on wiki spaces) which is a second semester course I teach to Contemporary Australian Indigenous Art students at Queensland College of Art - Griffith University, Brisbane. Here is another selection for the other resource for the non-institutionally-affiliated-student or Life-Long Learner. The Australian Critical Race & Whiteness Studies Association examines Whiteness in an Australian context, exploring the racialised nature of our country. They hold regular conferences with a regular journal published that you can access from the website. Amber from Online Universities Weblog sent this link to 10 Incredibly Inspiring Self Taught Scholars this afternoon. It made me think about how we as adult learners/teachers fail to engage with what we're learning/teaching and we underestimate the role of self-teaching. I gave a guest lecture yesterday at QUT for pre-service teachers. It was in one of those gigantic lecture theatres (you know the ones that are kind-of cost-effective because they fit all your first years, but don't really allow you to really connect?). What I noticed though, is that the majority of the students were sitting up the back of the theatre and there were many not even present. What I wondered today as I was reflecting on yesterday, is "what kind of teachers will these learner make?" If you're learning something because you "have to", because the university is "making you do it", then that's one heck of an uninspiring place to engage. I've been guilty in the past of prefacing an upcoming lecture with a 'you just have to learn this because the course outline says you have to' statement. Thinking about that today, I can't believe that I would say something like that. How dare I influence another person's engagement with a topic simply because I've not bothered or had the energy to find a point of engagement. I think that's the task - find a POINT OF ENGAGEMENT. A place where you can connect with the subject. When I was teaching Indigenous Art, Protocols and Practices at Queensland College of Art, I would have many international students in my class struggling to understand concepts of appropriation of Aboriginal iconography and cultural knowledge. But I tried to relate it to their own culture. Many of the "Asian" students could understand cultural appropriation because they could see it in every second Hollywood blockbuster - where every leading man is a martial arts expert who had appropriated the surface of the art, removed it from its context and altered it. This, relating the learning to your context is a POINT OF ENGAGEMENT. The students, many of whom would return to their countries and more than likely never engage with Indigenous Australians again, were able to connect with the course. We can take a lesson from the inspiring self-taught scholars - find a POINT OF ENGAGEMENT. Something that draws you in to a subject and allows you to develop an intrinsic motivation to learn. That's the kind of learner-teacher I'm trying to be. So far in this semester, students have explored concepts such as standpoint, epistemologies, the power & privelege of knowledge. In this lecture we expand these concepts, but also include the idea of the critical classroom & inquiry to highlight the importance understanding & incorporating different knowledges and world views into your practice. they are writing about us but saying negative and insensitive things which tell us we are not good." Re-reading this quote this morning, I've realised that above is most certainly true, but less true in a critical classroom. In a critical classroom, you're not just interested in "what the knowledge says" but "how did we get that knowledge in the first place". A critical classroom expects a constant tenor of inquiry that questions and reflects on what is written/said, who wrote/said it and why. Many parents of Indigenous children in Australian clasrooms do not see this idea of the critical classroom in practice. For many parents, the singing of the national anthem & the flag is problematic. In addition, many schools in Australia still only have a single flagpole (for the Australian flag). What impact (for better & for worse) does our world view have on our education practice? How can we "alter" our practice to make it more effective? 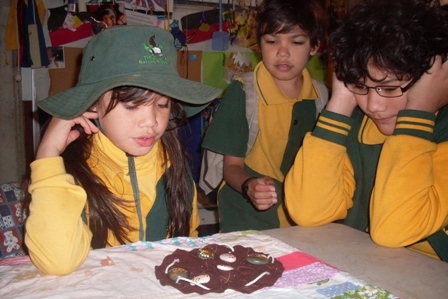 Two examples in the key learning areas of art/SOSE and science show that it is possible to incorporate different ways of seeing into the everyday classroom, not just at NAIDOC week. I'm making up an acronym - Free-Range-Scholar (I think I've plagarised it from @blogdiva - but because we're free-range its okay). I've referred to myself in recent years as an academic refugee - its like a Life-Long Learner, but kinda not, because despite ourselves, we do look for the rigour of academia (even if we don't always achieve it). But I think we FRS' love reading academic texts - newspapers really are not enough & some stuff on the web is dodgy (not all - but some. This is fine if you're a university student or staff member, then you will have access to that stuff through your library's databases. However, if you're NOT then its really hard to access some journals. They cost $$. So, under the blog category of free-range-scholar, I'm linking good quality writings from the web (readings, journal articles & ejournals) about all kinds of topics. The first is the International Journal of Critical Indigenous Studies. They're based at the Indigenous Studies Research Network based at QUT, Brisbane, Australia. If you know of any good journals on the web, drop me a line. Birrguu Matya. Have you heard of this game before? Its great. My kids love this game. It comes wrapped in a little foldable felt mat (which doubles as the game board). I hang it up so it doesn't get lost. I've not been able to find very much information at all about the game, nor its creator Donna Hensen. Well, when I say creator, I mean creator in its current format, as its based on a traditional game from the Wiradjuri people. I highly recommend this game for students. I'd purchase one or two sets at least for the classroom, then inspire the students to make their own games using whatever is around them. Here is a summary of the information that I can find about the game, including where you can purchase it. you can purchase it from Dreamtime Kullilla Art Products , Echidnas on the Loose, Eco-Toys, Gecko Educational, Kangaroo Valley Woodcrafts, Bud's Toys , and many others. The prices are probably all very similar once you take into consideration credit card fees and postage. Though I've bought mine from Dreamtime Kullilla Art Products as they are an Aboriginal Owned Company (some of the others listed above may be as well, but i've not researched them). I've not been able to find any further information on the internet about Donna Hensen the designer. But I thoroughly recommend this game to every family. 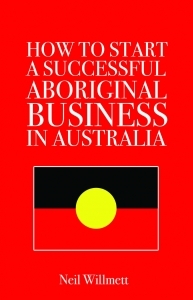 Neil Willmett's How to Start a Sucessful Aboriginal Business published by Brolga Publishing (ISBN 1-92122-146-1) is available for business students. Chaos - have it for just over $23. - Amendment - you can check out Artist As Entrepreneur Wiki a 1 semester undergraduate commerce course. Neil's book is the text book. In its second "official" year, Australia's Blak History Month is steadily gathering momentum and is being helped along by social networking tools. And importantly, there is a "buzz" as more people start talking about this new celebration. Of course, a big shout out goes to Sam Cook from @kissmyblakarts for kicking the whole thing off in 2008 (and for the initial logo design). So keep sharing folks, what you're doing? what you want to do now and/or in the future? It will also be interesting to watch as non-Indigenous Blak Australians start participating from their own communities. Follow @kissmyblakarts on Twitter to get the link to your Great Moments in Blak History downloadable worksheets (or join the facebook group where they are also available). All the days we know of as important and meaningful are created. Here is a worthy event to celebrate. It started small in 2008 but can grow into whatever we want it to. This announcement is from Sam Cook, initiator of Kiss My Blak Arts. As we mark this day as a moment of Indigenous Survival, let us note that it has been one year to the day, that the message was sent to Australia and the World, to recognise and celebrate JULY as AUSTRALIA'S BLAK HISTORY MONTH. From a humble grassroots pledge - to what continues to gain momentum daily - let us collectively look toward how we can each play a role in promoting a month of positive pride to share, celebrate and carry forth the history of the 1st Australians - Aboriginal and Torres Strait Islander peoples. Please encourage more people to join the group and/or talk about it in your local community, amongst family, your mob and people of ALL backgrounds and heritage, so that they too, can Celebrate with Us. By breathing life into BLAK HISTORY MONTH, you will each take your mark as founders of a lifelong legacy, itself a moment in BLAKISTORY. Students will ask "why can't we use Aboriginal images?" Particularly if they see the work of artists like Richard Bell, who is deliberate in his appropriation of "western" artists like Lichtenstein or Tillers. "If he's apppropriating, why can't we*? Firstly, Aboriginal art was never "given" to the western art industry as a school of art to be appropriated. Picasso knew what he was doing when he first exhibited cubism - he was well aware of the impact of his use of this style and what it meant. However Aboriginal artists, when their work was first being installed as art objects into galleries (and out of museums as ethnographic cultural objects), in the last quarter of the century, would have very little idea about the Western art market and its conventions. Many "traditional" artists still are not aware of their rights (and responsibilities). Secondly, the imagery/iconography may have spiritual significance and by re-producing the image you may inadvertently "call-up" something you're not meant to. Thirdly, why use the image in the first place? The fact that the image is not from your country, your people, your culture, your heritage, meants that you have completely de-contextualised it. You would be hard pressed to create a new meaning for existing cultural icons that would "hold-up" to a critical analysis. 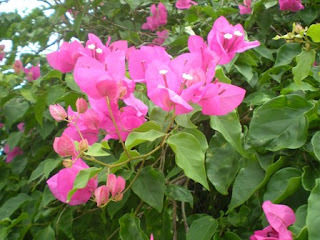 Above all, CREATE FROM WHAT YOU KNOW - don't look for inspiration in the foreign exotic interesting native. * Yes I have assumed that the "enquirer" is non-Indigenous. Thinking further about "The Australia Book" written by Eve Pownall, it might be worth exploring the artwork of Aboriginal artist Tony Albert. 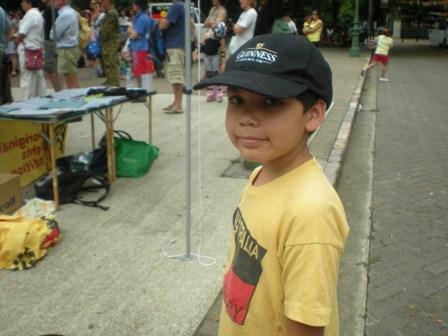 Tony originally comes from Cardwell but now lives and works in Brisbane. He is a member of ProppaNOW artist collective. His work shown at Gallery Smith in Melbourne in 2008, is a re-positioning of imagery from the period Pownall grew up, worked and lived in. The "Australia Book" written by Eve Pownall and Illustrated by Margaret Senior is an Australian history book with quite a standing amongst older book lovers, teachers & librarians. Written in 1952, it's obvious to see why, its colourful, it doesn't hark back to Mother Britain. It attempts to capture Australia from an Australian perspective. And this is where my concern lies. It is white Australian in its perspective, assumptions and values. Aboriginal people are romanticised in the beginning section, portrayed as savage, simplistic and even helpless in the middle, and have disappeared by the end of the book. And while New Guinea is mention, the Torres Strait Islands are completely invisiable. This book should NOT be used as an accurate account of Australian history. Chinese peoples and other nationalities are completely invisible (though there is a mention at the end how new immigrants to Australia don't always speak English. At this point, one might argue, that I'm being a bit harsh "we didn't think of those things in the old days". And I absolutely accept that. And I'm not really questioning that. I question how we might use the book today. The book should be used as a text to analyse how White Australia used to see itself - herioc, hardworking, stoic, rough & tumble. All of those adjectives that are visualised in the symbolism of our nation - Simpson on his donkey, the digger on his horse, the shearer, the drover etc. Thee symbols of White masculinity are reaffirmed in Eve Pownall's book. It is an excellent study of Australia - though perhaps not how Australian's think they see themselves today. In our house, the 26th of January is Invasion Day. We do not celebrate or recognise Australia Day. We live in Brisbane, so each year we march. We march to remember those who have marched before us and made our world a better place. We march to remember those who were not able to march. We march to remind others that soverignty has not been ceded. We march to keep clear the vision of what we have and what we do not have. This position is neither right nor wrong, better or worse than anothers. It simply is. In your classroom you should recognise this, celebrate it and respect it. Do not force your young students to colour in the Australian flag. Give them a choice of flag to colour - respect their heritage and their identity. Would like to embed this image into your classroom blog? Click here for the link. Easter is Deadly & its on my lounge room floor! No that doesn't mean my floor is covered in chocolate. It mwans that our teacher books have arrived. 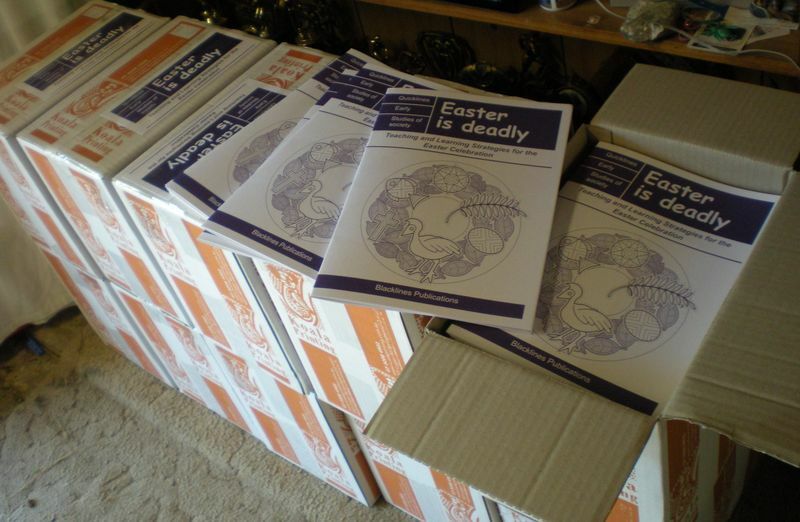 Easter is deadly is designed for early childhood educators (including daycare & pre-schools) interested in embedding Indigenous perspectives into all aspects of their curriculum. I'll be uploading heaps of ideas and additional resources over the next few days as the books start shipping to schools all over Australia. If you haven't ordered yours, just grab an order form. One of the problems is that many of the areas we look at go across multiple KLAs and stages. I'd love to get feedback as we refine the approach we'll take. Over the next week when I get a chance, I'll re-jig the categories and see if they're more user friendly. The Map of Aboriginal Australia was developed by Dr David Horton and the Australian Institute of Aboriginaland Torres Strait Islander Studies (AIATSIS) in 1994. I believe that AIATSIS and Dr Horton own the copyright for the map. We recommend that each classroom should have a copy always available for their students. You can purchase the Map of Aboriginal Australia (affiliate link) here. (Please note: these sites are external to Blacklines and AIATSIS and may not have copyright permission to make the map available). Update 2 February 2011 - I have signed up as an Affiliate with Fishpond.com.au, an Australian online retailer of books, dvds and other products. I receive a small commission on each sale generated from my recommendation. Had a yarn with a deadly young Murri yesterday. He's worked in schools & is currently working in criminal justice. He was reminiscing about his time in schools in Logan. Too many of the schools & teachers thought that implementing Indigenous perspectives was to - add in some traditional sports on sports day or find a dance group for their "cultural day". Indigenous perspectives should be - everyDAY not specialDAY. Its ORDINARY not extraORDINARY. Don't agree? Have a yarn & maybe we can lend a hand. 2008 saw the creation of Blak History Month in Australia. Ms Sam Cook from Kiss My Blak Arts declared it, create a poster and shared the idea and vision. I heard my first Australia Day ad for 2010 on the radio on Christmas Day (the australiaday.org mob are at it again!). Just as we start gearing up for the Back to School sales, we're also going to be bombarded with Australia Day advertising - telling us how to be better Aussies & to be proud. Always problematic this one. Well, Blacklines is going set ourselves a challenge and create some resources that are true to our beliefs, as well as fun for students and useful for teachers. Alot of thinking is going into this one - let's see how we go. You may have noticed that we're using the terms "Aboriginal and Torres Strait Islander" rather than "Indigenous". Well some people prefer the term Indigenous, while others prefer Aboriginal and Torres Strait Islander. And in the end, I think there is probably as many reasons for one as for the other. Despite this, we have chosen to go with the latter. It may have something to do with our age (both in our forties). While we were growing up, Aboriginal and Torres Strait Islander was all we heard. Well - that and Murri, Koori, Goori etc. During the United Nations Year of Indigenous Peoples in 1993, the term INDIGENOUS became used more and more, til gradually it has become an accepted term throughout governmental agencies and inside the community. We believe that there has been a trend within the communities to go back to the term Aboriginal, or even a step further and use langauge names (anecdotal evidence only). So, we've decided, for better or worse, that we'll go back to our original roots (so to speak) and use the term, Aboriginal and Torres Strait Islander Peoples. If you're in a school & are trying to work out what terms you should use, well firstly, go to your school community and ask them what they think. Secondly, you will also have policy documents written that will provide some direction. What does your school do? As a free-range scholar & educator, I tend to go off course a bit occasionally (well - maybe more than occasionally). I've recently re-discovered Critical Theory when preparing a guest lecture for Bianca Beetson's Indigenous Art, Protocols and Practice unit at Queensalnd College of Art - Griffith University. 1) It challenges accepted truths & norms, it asks you to dig beneath the surface. 3) At its core is the concept of liberation & democratisation. 4) It assumes that there are no single truths and no absolutes. 5) Critical theory asks/demands that you become aware of yourself as knower/viewer. 6) Encourages you to get into action - don't just sit & watch the world - seek change & transformation - it gives you a framework to "be in the world. 7) It can form a framework for your practice regardless of what your field is - art, education, research, mathematics, science. * These are the author's I've read - have you got anymore you could share? We'd love to here from you & aslo from examples of educators using critical theory in the classroom. Firstly, the teaching of Aborignal & Torres Strait Islander perspectives into classrooms will not by itselt "close the gap" of student educational outcomes. A number of schools have already worked hard to ensure that cultural perspectives have been embedded across their curriculums. For the bulk of schools however, this challenge will require quite an investment. However, in thinking more about this issue - I would challenge teachers to NOT consider embedding Aboriginal & Torres Strait Islander perspectives as a burden. If you only consider this as something that "I have to do", then you will probably not teach it effectively. Rather, approach the embedding of Aboriginal & Torres Strait Islander perspectives that will provide you with a much more well-rounded knowledge of Australia. It may seem bizzare that a blog devoted to talking about Aboriginal and Torres Strait Islander perspectives should have this post as its second one - yes, true - but perhaps we won't do things in an expected way. Do you have a PLN? No, you don't have a Personal Learning Network you say? Well, I'm a firm believer that social media and a full range of technologies can only help to support teachers in developing their critical classrooms. I found thisarticle on smartteaching.org via Gerald Weber on Twitter.